This one is too easy not to share. You’d probably do the same thing if you were going to make one, but I felt like writing a DIY post anyway. 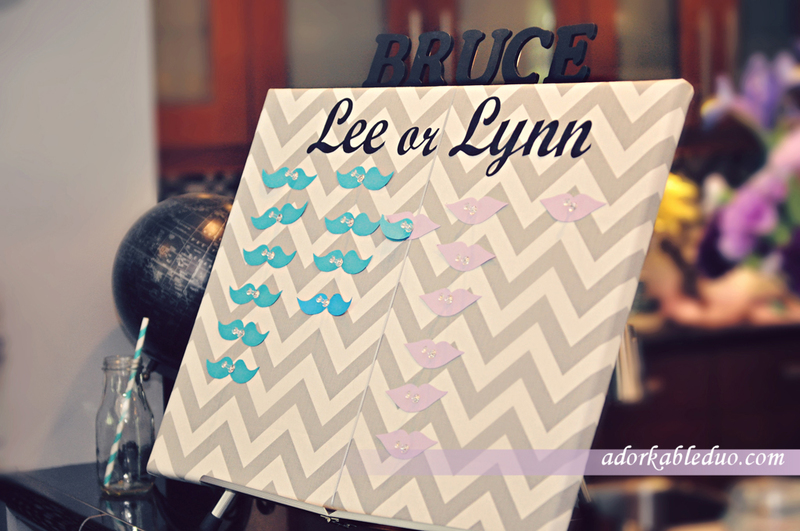 I originally did this for our Gender Reveal Party to pin mustaches or lips for the Old Wives Tale Game, but will be retrofitting it to work with the baby’s room. It would look great in any office too! 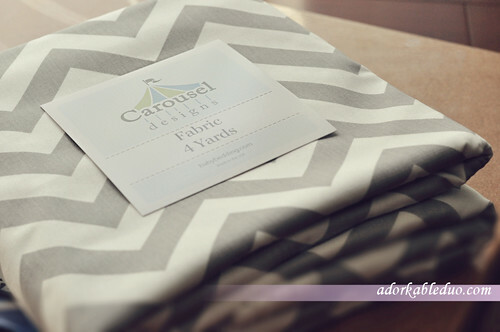 fabric in the pattern of your choice – I got my grey chevron fabric from Carousel Designs. First, lay the corkboard on your material and size it up. 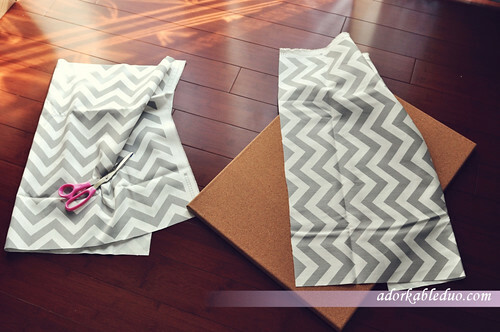 (Wrap the fabric around the edge to make sure you have plenty of material to curl around the edges.) Also, make sure you align the pattern so that it’s not offset of crooked. Then, cut away! I ironed the fabric after cutting. Move to an area where you don’t mind it if a staple from your gun went through. I am so glad I avoided our new hardwood in favor of the craft room downstairs. There is definitely a staple, or two, going through our carpet square. On that note, check to make sure you know which end the staples will be shot out at and you’ll avoid the whole staple-through-your-carpet-square fiasco. 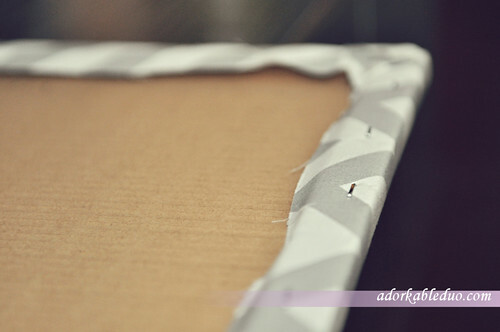 Align your fabric to the corkboard and staple around the perimeter. Keep the fabric taut! Like the fabric? Carousel Designs has a ton of adorable prints if you like! How much fabric did you purchase from Carousel Fabrics? I absolutely love your entire them!!! 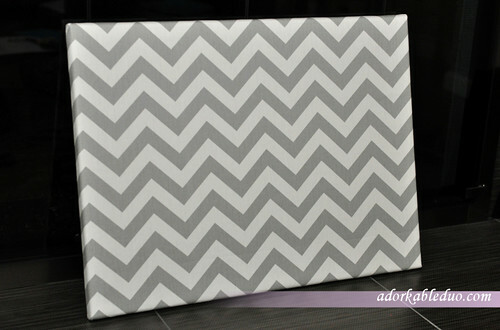 We are having a gender reveal party next Saturday and my colors are bright pink and aqua and then I’m wanting to incorporate this grey/white chevron. Love it all! I bought 4 yards to cover the table length and the corkboard. After the party, I used the table cloth and made a storage bench for his room from it!